Cassadee Pope performs at The Key Club during her first solo tour. 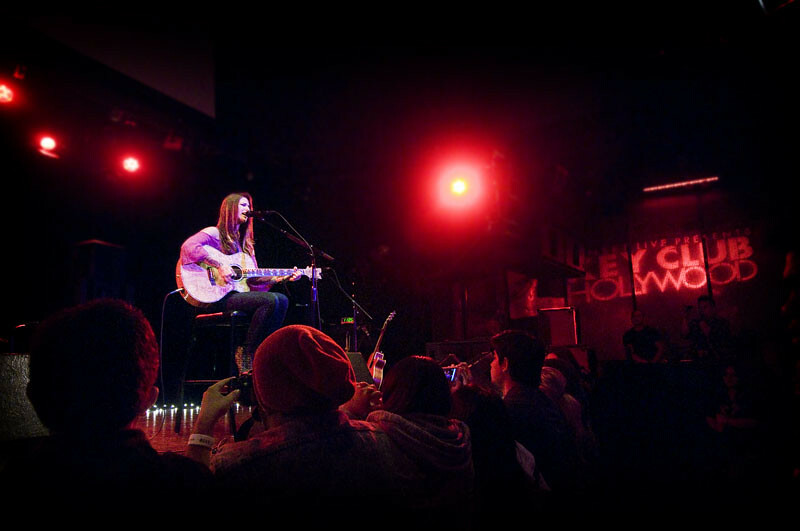 The Key Club on Hollywood's famed Sunset Strip was the scene for Cassadee Pope's intimate show that had the feel of a VH1 Storytellers concert as Pope took time between songs to share stories behind each song. It was her first ever solo tour after touring non-stop for four years as the front-woman of her power-pop band Hey Monday. Tuesday night, Pope crac ked open her music box - a 15-song set that included new original songs while also throwing in some familiar acoustic versions of Hey Monday tunes such as "Wish You Were Here" and "I Don't Wanna Dance." "Candles" was an altered version of the sad ballad slow jam where the album version uses a piano but tonight it was delivered with acoustic guitars accompanied by a weeping violin. It was truly an intimate show with a bare stage, Pope blanketed in a warm, soft glow of red, wearing an open-sleeve blouse and cheetah-print platform pumps as a devoted following sang along to her new songs not yet released. In fact, a preview of a song Cassadee posted last month already amassed over 18,000 hits. And it was that song "Lunatic" that she brought out Justin Young, which she co-wrote the song with, on stage to perform with her. Another surprise guest appearance came when Yellowcard's Ryan Key joined Cassadee for two songs,"Hang You Up" and "Only One." Listening to the stripped down songs further showcased Pope's vulnerable yet confident vocals, especially on a cover of Ednaswap's "Torn" (or as most know it as Natalie Imbruglia version) But of course, her new original songs were the highlights of the night with powerful memorable hooks delivered over soaring melodies. Lavished with haunting strings, "I Told You So" is about overcoming rejection and not giving up on your dreams, "Proved You Wrong" has flavors of Hey Monday while "Second Hand Love" she explained, was inspired by Sugarland. Cassadee Pope performs at The Key Club. Towards the end of the hour-long set, Pope invited the crowd to sing along with her to “How You Like Me Now” and then ended the night with “6 Months,” a song she said she wrote when she was 16 for a boy she was dating for their six months anniversary. Eventually, she says, they broke up soon after. It was a night of old and new, Pope entertaining her devoted fans with classic Hey Monday songs while also celebrating her future endeavors as a solo artist. And what this night proves is that even though Pope’s new songs showed a new maturity to her writing, she doesn’t veer far from her power/pop roots that her fans have come to expect from her.